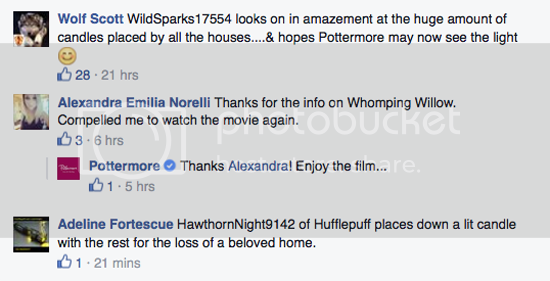 As I wrote here, the once great site known as Pottermore fell to the Death Eaters and Dolores Umbridge appears to have taken over the security of their social media. 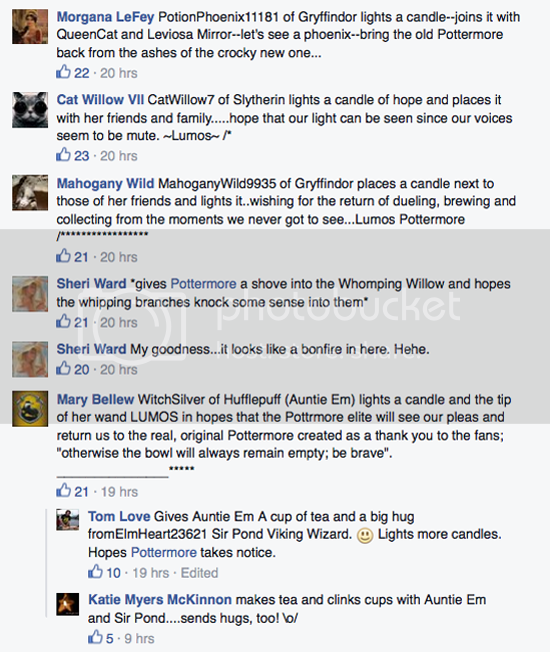 A once vibrant, atmospheric, and interactive site has become a slick, but substance-free marketing blog for Warner Bros.
Last week many former members of the original Pottermore turned out on the site's Facebook page, and under a tedious post about the cinematic version of the whomping willow, they staged a candlelight vigil in memory of the once great site and in hope of its return. 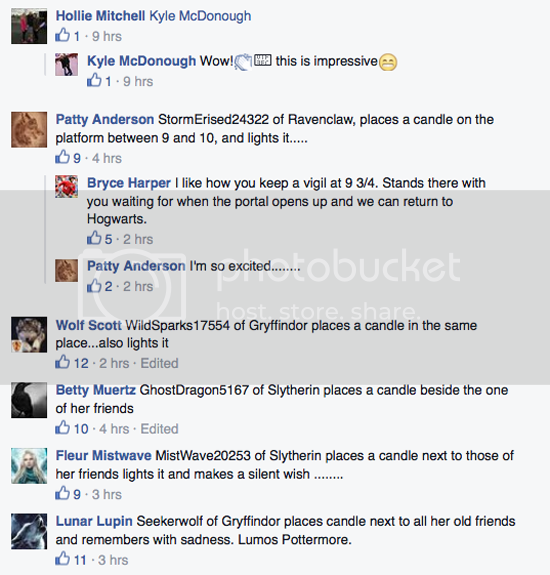 One by one they lit candles and placed them at Platform 9 3/4. 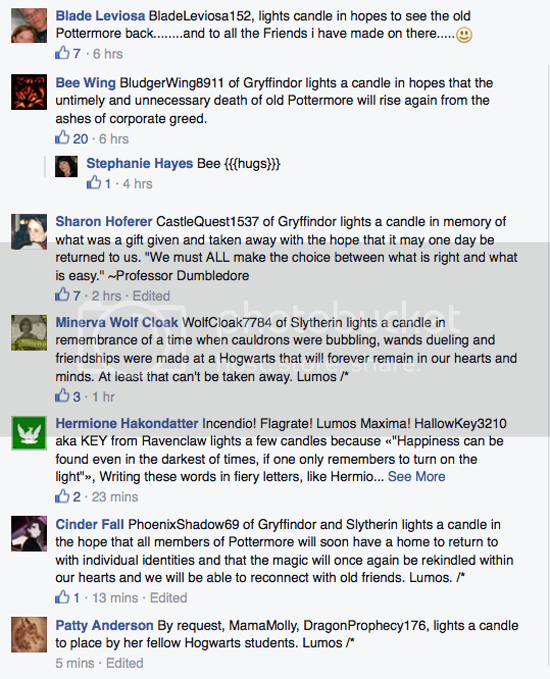 It should come as no great surprise that Pottermore admin did not care for this peaceful expression of grief all over their shiny new marketing vehicle. 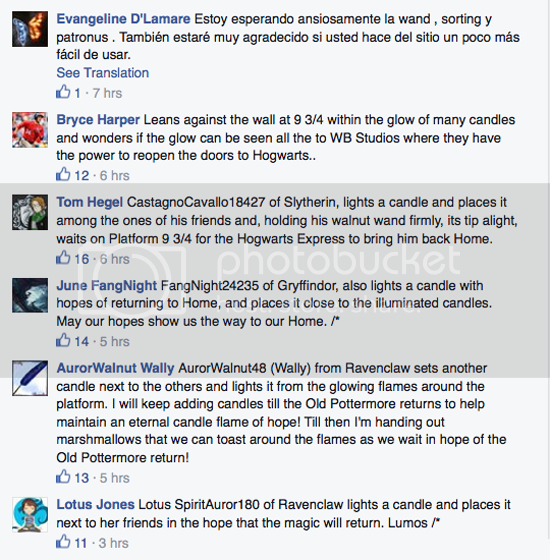 They quickly snuffed out the candles, which is to say, they deleted the comments. They missed a few stragglers. In particular, take note of Wolf Scott's post. It makes for a good marker. 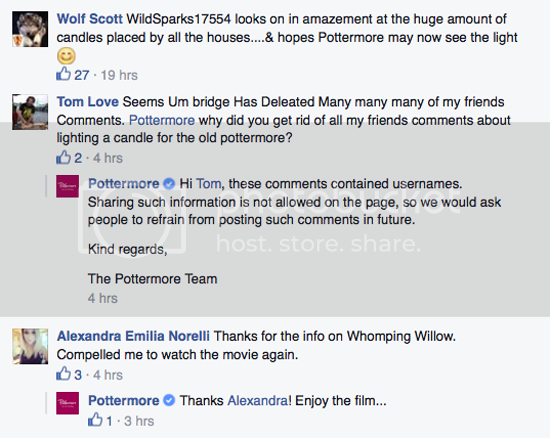 When pressed, they justified the deletions, claiming that usernames from the original Pottermore are not allowed on their Facebook page? Since when, we ask ourselves, and why? 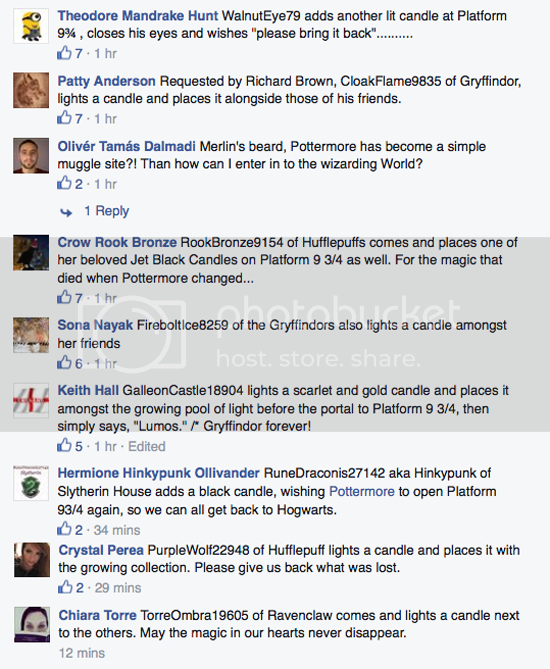 And so, some former Pottermore members attempted to put their candles back by the desecrated memorial, dutifully omitting their usernames. 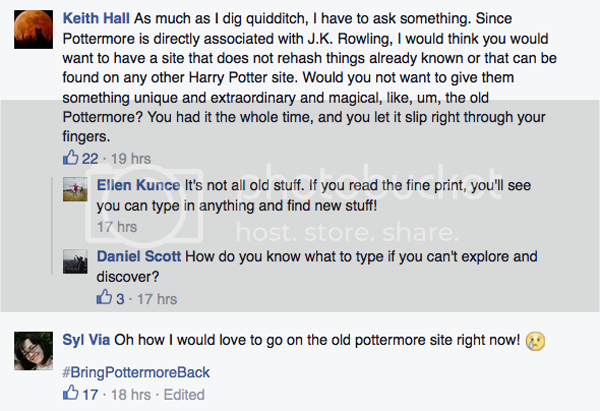 At which point, Pottermore deleted, not only the new usernameless comments, but any evidence that they'd ever stated such a rule. 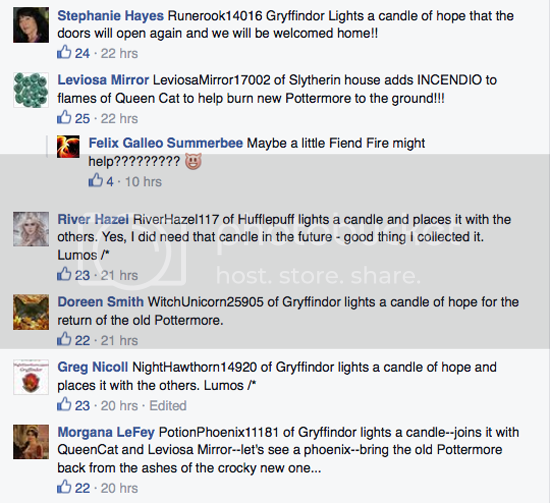 Since then, many candle comments have come and gone. But, currently, it looks like this. 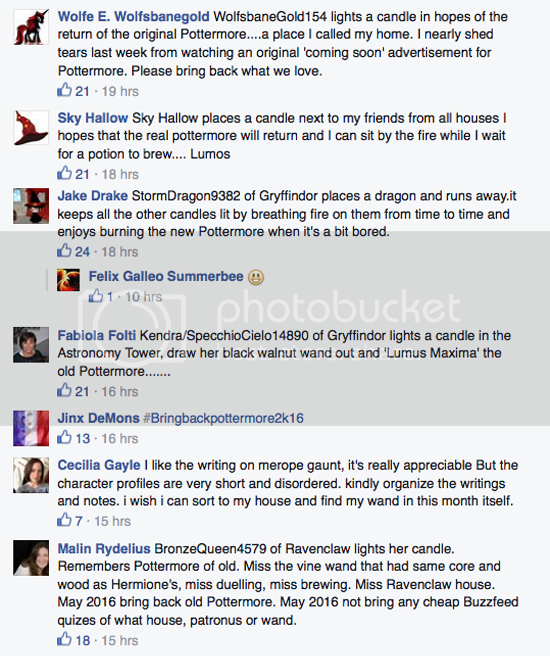 Pottermore continues to draw complaints on a daily basis. Admin routinely takes a hatchet to the page, deleting complaints and some perfectly innocuous comments as well – collateral damage, I guess. It misses stragglers like Wolf Scott's comment. 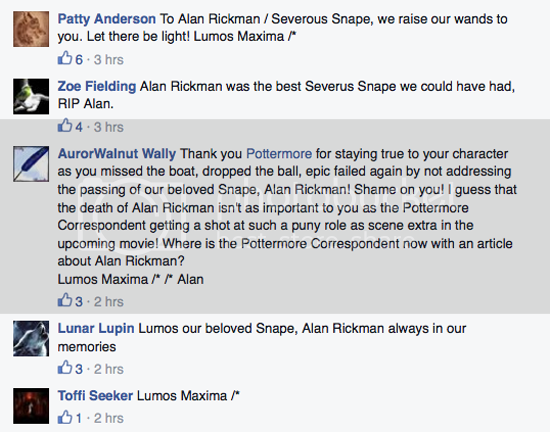 The new Pottermore censors its Facebook page ruthlessly, but with about as much competence as it does everything else. Almost more painful than the loss of the old site is just how bad the new one is. 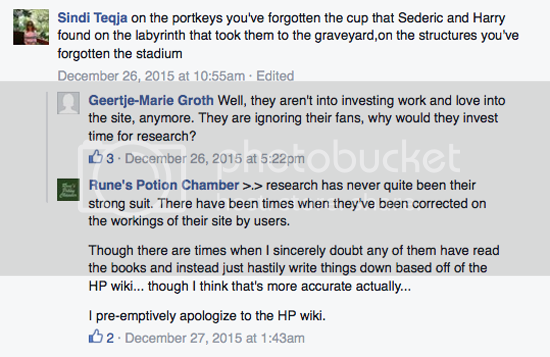 The Pottermore Correspondent is a worse writer than Rita Skeeter and about as factual. Not only are the articles facile, boring, and demonstrating the most superficial understanding Rowling's text, they are frequently wrong. Their Facebook followers – let's call them people who've actually read the books – can be seen routinely correcting and attempting to clarify details in their text. Where the original site boasted new, original writings from JK Rowling, the new Pottermore has all but buried those same texts. But, you protest, there's a specific heading for Rowling's writings! Yes, there is. It takes you to this page. As of this writing, it lists eight of her original pieces. The most recent offering is her background of the Potter family, which was published when the new site launched last September. Additionally, there are links to her background articles on Professor McGonagall, Gilderoy Lockhart, Sybill Trelawney, Dolores Umbridge, Remus Lupin, Professor Kettleburn, and Professor Quirrell. Those of us who used the previous site, though, know full well that she wrote far more commentary than those eight pieces. I had every one I'd read saved to my account, so that I could return to them again and again. I had over seventy such links, which were all vaporized with the site. I looked for them on the new site. It took quite a bit of work. First, I used the discover search feature, by typing the word Rowling. Ta da! Wait... this list of headings still points to only a fraction of Rowling's additional texts: Draco Malfoy, Pure Blood, The Malfoy Family, The Original Forty, Familiars, Secret Keeper, Polyjuice Potion, Illness and Disability, Hogwarts School Subjects, Potions, Extension Charms, Alchemy, Clothing, The Sorting Hat, Pensieve, The Philosopher's Stone, The Sword of Gryffindor, Technology, The Marauder's Map, Cauldrons, History of the Quidditch World Cup, Firebolt, Scottish Rugby, Gobstones, Mr. Ollivander, Wand Lengths and Flexibility, Wand Cores, and Wand Woods. To find the rest of Rowling's writings on the new Pottermore meant following links from page to page and, ultimately, a deep Google search. I found 77 such pieces. So why are roughly half of Rowling's texts buried so deeply on the site? Why does the link to "Writing by JK Rowling" bring up only eight of her writings? The answer, I surmise, is artificial inflation of page views. 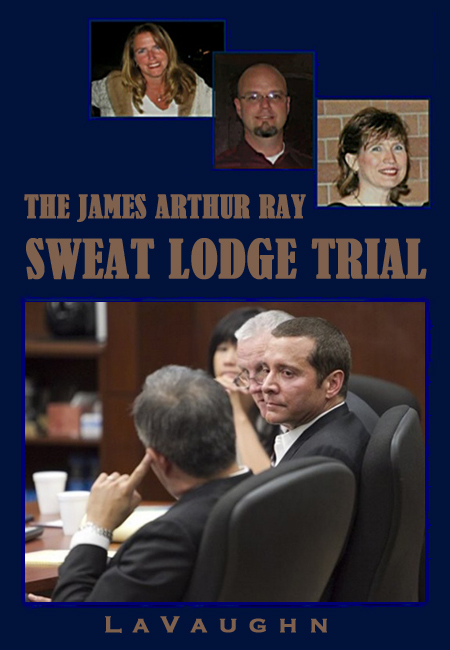 If they provide a simple, honest index of the site, readers will quickly find what they want to read and move on. The design of the site forces you to click through multiple gateway pages and buried links to find any valuable content there is to find. There's also a truly shameless attempt to put Rowling's writings on the same level as the drivel produced by the Pottermore team. Their argument, of course, is that all you need do is begin typing on the "discover" bar. But, as one reader pointed out, how can you search for what you don't know is there? Rowling's past writings have included background on such obscure topics as Celestina Warbeck, the Inferi, and Sir Cadogan. Would it occur to the average reader to search out such topics, not knowing that she's written new material about them? 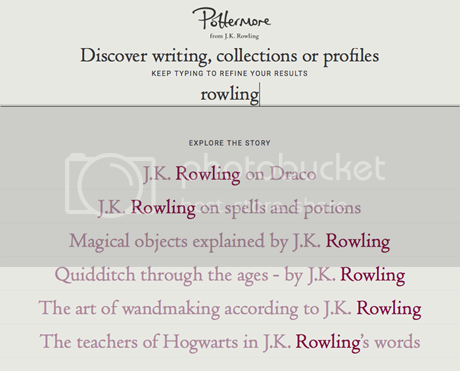 On the old site, the complex, multilayered, and searchable scenes were marked with plumes when they contained Rowling's writings. You had to look for them, but then they could be locked in your trunk. The new site's pale imitation of this process of immersive discovery is to hide this rich content in a maze of bad writing, cheap headlines, and buried links. You can't save them to your account, because there are no accounts. 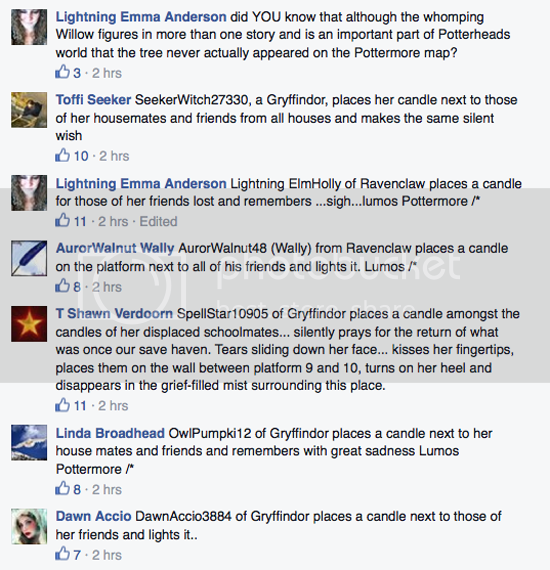 And what of the new sorting hat, wands, and ever-elusive Patronus test? 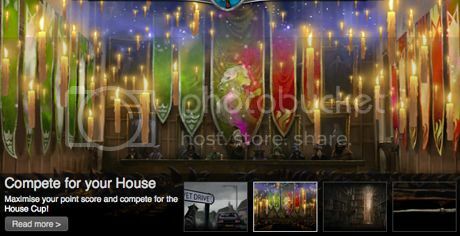 It has now been nearly four months since they pulled the plug on the original Pottermore, five months since they publicly announced the coming changes. 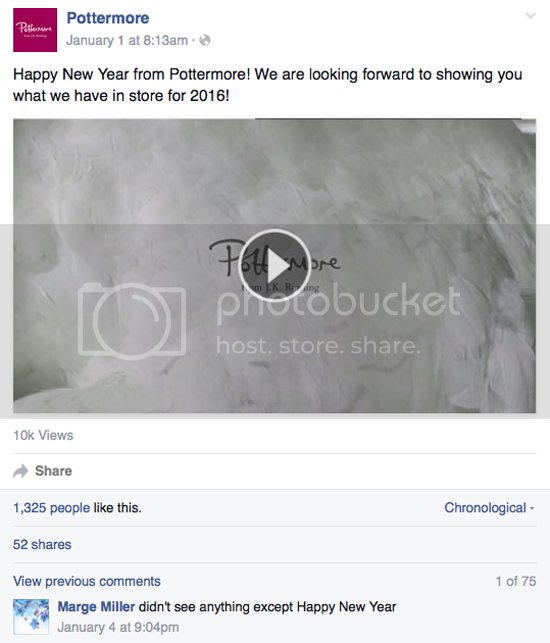 In one bit of unintentional hilarity, they released a New Years video, and for umpteenth time, breathlessly announced that they just can't wait to show Pottermore readers everything they have in store for the upcoming year. All it says is Happy New Year. 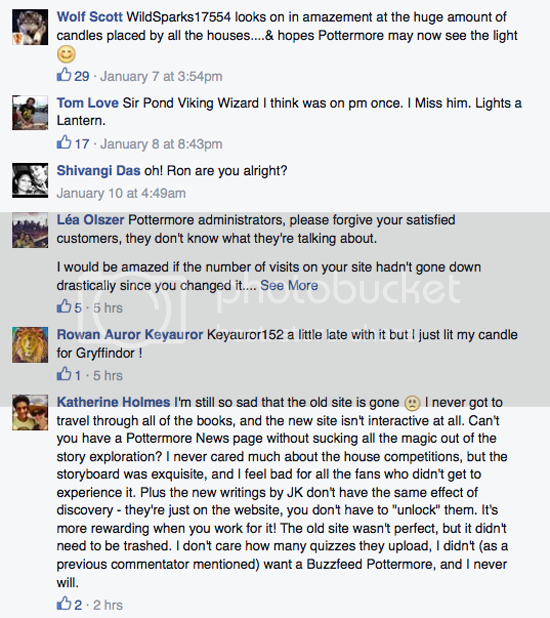 That's the new Pottermore in a nutshell: empty promises and style without substance. I was deeply saddened to learn this morning that Alan Rickman, one of my favorite actors and the man who brought Severus Snape to life on screen, has died. 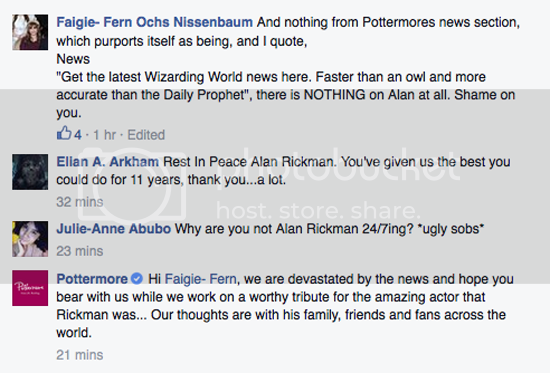 There was, unsurprisingly, an outpouring of grief on my Facebook feed, much of it from Potter fans. I glanced at the Pottermore page expecting to see a notice and a lot of sad commentary from those followers the page has managed to retain. It was, at that point, four or five hours after the news of Rickman's death had broken. But, on the Pottermore page, nothing. I have to admit that I was a little thrown. It's not that I expect a whole lot from Pottermore, at this point, but acknowledging the loss of a beloved member of the Potterverse is so basic, so fundamental, I thought there would be some comment from them. I was not alone in these sentiments. 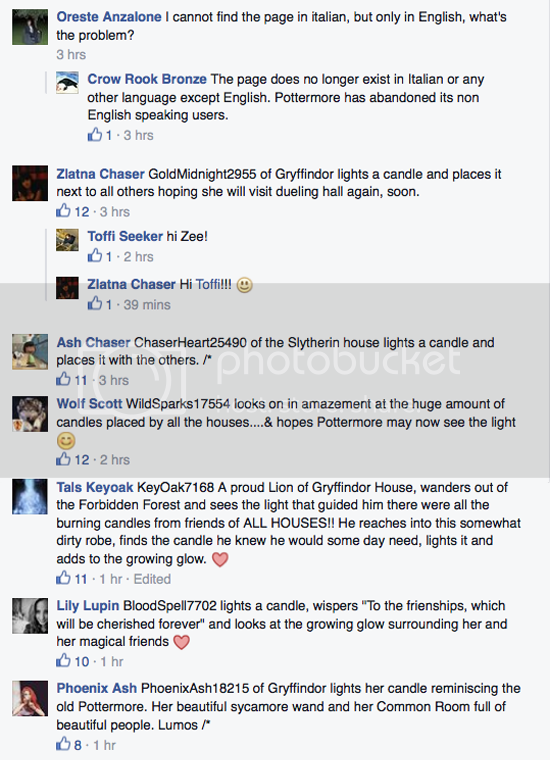 I looked at some of the comments posted by Pottermore followers under their golden snitch thread. 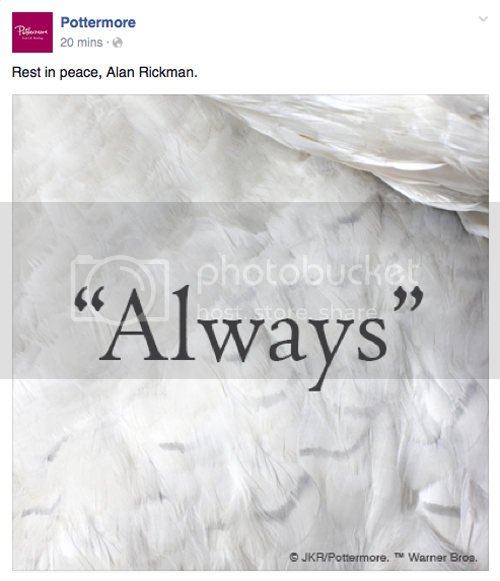 And so, roughly six hours after the news of Alan Rickman's passing broke wide, Pottermore posted its "worthy tribute" to one of the finest actors of our time. Why it would take them hours to add the word "Always" to their stock graphic and write a sentence is beyond me. Ten minutes after this went up, it had over 150 tearful comments. Within an hour, over 500. 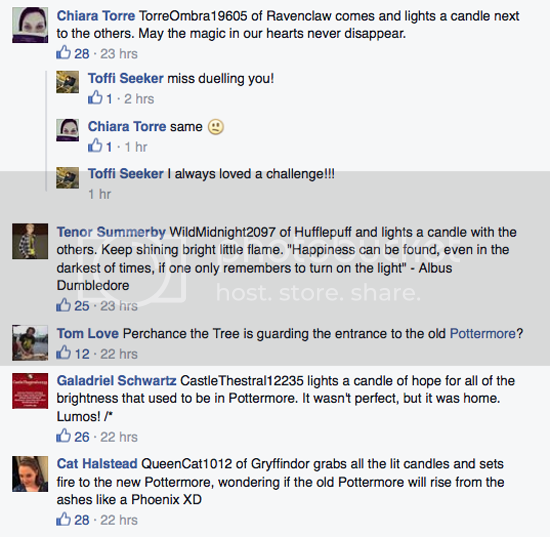 This is what the new Pottermore just doesn't get: community. The original Pottermore was a complex, interactive environment. 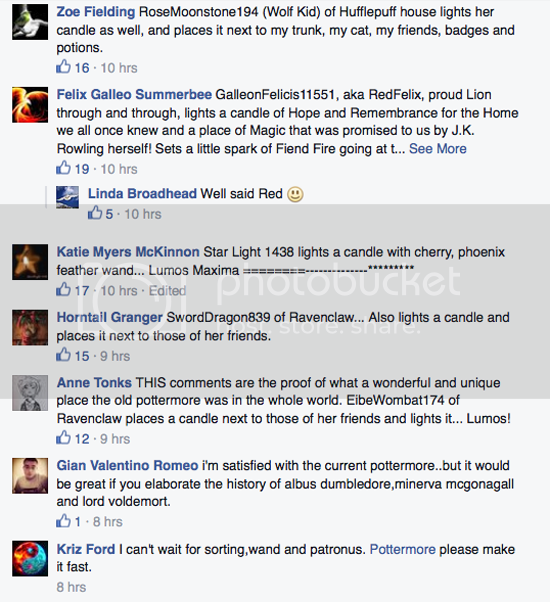 Many friendships were formed around common interest and devotion to the magical world Rowling created. When they dissolved the site, they laid waste to that community. Worse, like so many corporate structures, they seem to see their fan base as a resource to exploit entirely for profit. They're giving nothing of any substance back, not even a suitable acknowledgement of a very sad day for Potterheads everywhere. 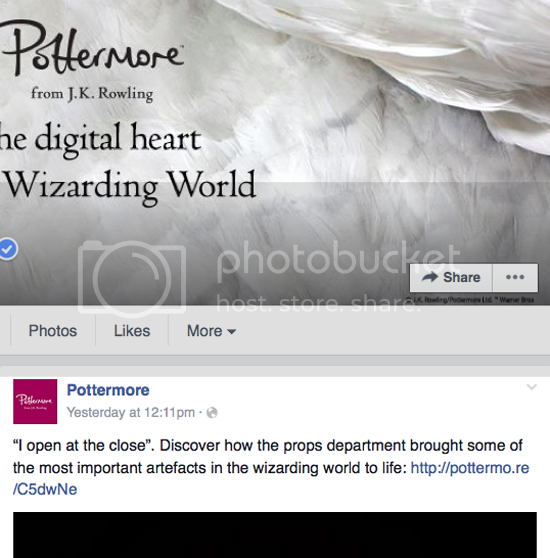 Pottermore now exists entirely as a promotional site. But, even a promotional site should have the public relations smarts to acknowledge the inevitable grief of their followers at such a loss. This was a massive fail on their part. It's shown them, once again, to be completely tone deaf.